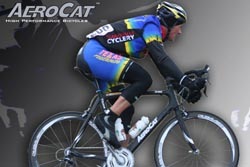 AeroCat LLC, an Indiana based high performance bicycle manufacturer, is pleased to announce its sponsorship of the Texas Roadhouse Cycling Team for the 2009 season. The Louisville headquartered national elite road cycling team will be racing the company's R505 high performance bicycle carbon fiber frameset. Texas Roadhouse Cycling plans to compete in over 150 races throughout the season including several NRC races across the nation. AeroCat is stepping up its marketing efforts in the Midwest by reaching out and supporting the elite cycling community. "This year our center of attention is right in our backyard," said Dave Poole, President of AeroCat. "There's a significant population of talented and passionate cyclists in our area that are hungry for a regional high-end bike sponsor. I'm glad we can be a part of it and enhance the sport locally." AreoCat's Midwest sponsorship includes Lindsey Wilson college in Columbia, Kentucky, Team Revolution women's elite team based in Saint Louis, Barbasol Rapid Transit Racing MTB team, and Texas Roadhouse Cycling based in Louisville. The company also sponsors an elite team based in Atlanta that will race under the AeroCat brand name for this season. "The R505 is a solid bike," said Curtis Tolson, elite Category 1 racer and multi-time national champion from Roadhouse. "It's amazing that a fresh brand could have top-level products that compete head to head with the big brands. The frame has remarkable power transfer, corners well, and provides a comfortable ride. It totally exceeded my expectations! We are delighted to be a part of AeroCat's grass roots marketing efforts here in the Midwest," said Tolson. Texas Roadhouse Cycling launched their road season with a couple of first place finishes on March 14th at the Long Run Park Circuit race in Louisville. Curtis Tolson won the Masters event and John Grant took first in the Pro1/2 race.